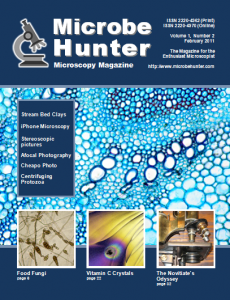 Welcome to the second issue of MicrobeHunter magazine. You can download the PDF and order a printed version. This is an absolutely incredible magazine and site! I’m only just now thinking about getting into microscopy although it’s been a lifelong, though only casual, interest. I’m getting ready to retire and I’m looking for an interesting hobby. Your site has convinced me that I’ve found what I’m looking for. Many thanks, and keep up the great work.